An emerald sedan sped past with a black man standing in the passenger seat—the yellow feathers of his headdress streaming out the sun roof. Glen swung a quick U-turn on Rampart Street, the northwest division between the French Quarter and the Tremé—the nation’s oldest African American neighborhood. The car now headed east towards the Faubourg Marigny, another boundary of the Quarter. We’d been up since 8 a.m. searching for Mardi Gras Indians in New Orleans on an unseasonably warm March 19th—St. Joseph’s Day. A newspaper had published the parade schedule, but it’s not always accurate. To see them, we needed to be persistent and lucky. Our local friend Glen drove through uptown neighborhoods with an architectural mix of antebellum mansions and wood shacks—some of which still had four-foot water lines and dead trees from Hurricane Katrina’s deluge. From there, we’d searched through Bayou St. John on our way towards the Creole houses and cottages of Mid-City and the Tremé. The now-fading high water marks here reached eight feet in some places. We scanned for flags, crowds, and feathered suits. All the windows were rolled down to hear chants and music. But the golden Indian in the beetle-green car was the closest we’d gotten in hours. From Creole Wild West to 9th Ward Hunters, Fi-Yi-Yi to Skull and Bones, Wild Magnolias to Yellow Pocahontas, the tribal costumes take the better part of a year to construct—all by hand. “They usually know how it’ll look before they put it together,” said Sylvester Francis, Executive Director of the Backstreet Cultural Museum. “But they gotta take a break after Mardi Gras before they begin sewing for next year.” Each suit can weigh up to 100 pounds and cost thousands of dollars to assemble. The day before St. Joseph’s, Francis let me touch some of the outfits he keeps in his museum. The jewel box sparkle of sequins, faux gemstones, metal, and crystal seemed to light the room. But alone, they’d be singing only melody without the harmony of pearls, cowrie shells, and the rainbow of seed beads. My fingers brushed across the sleek, cool decorations and followed the individual lines of color until they merged into a new design. The creations are inspired by traditional Native American scenes, African sculptural elements, abstract patterns, or fantastical creatures. Not to be outdone by the parade of beads, shells, and sequins, the fabric is equally attention-grabbing: velvet, satin, silk, yarn, rickrack, and cardboard (to make 3D figures “pop”). And finally, the feathers. No suit is complete without them. Francis’ wife Anita almost whispered, “The tribes get them only in white because they don’t trust anyone else to try and match the colors.” The plumes are then dipped in dye individually, to ensure the color is just right. Each Indian makes his own suit, sometimes with the help of family or others within the tribe. 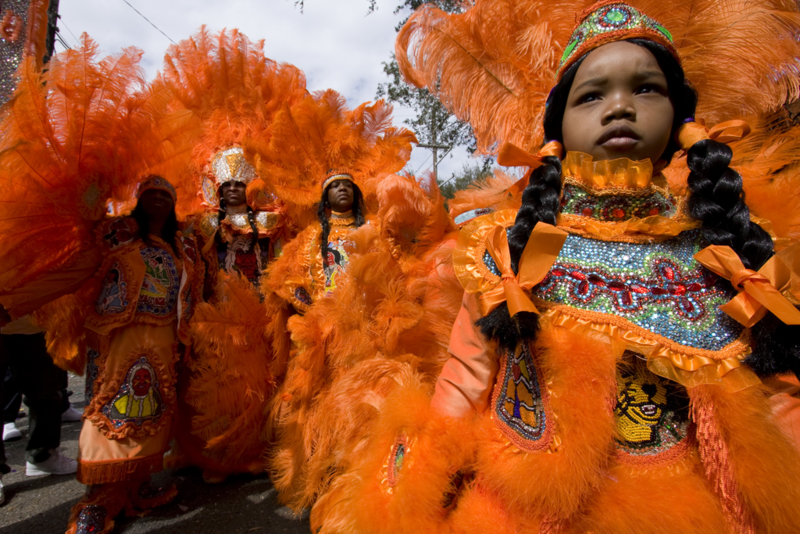 I’d seen the Indians in photos, at Jazz Fest, and at Mardi Gras, but I’d never chased them on St. Joseph’s Day. In New Orleans, the holiday is dedicated to the patron saint of the working man. The Voodoo tradition celebrates the day as a feast for Legba—messenger of the gods and trickster guardian of the crossroads. 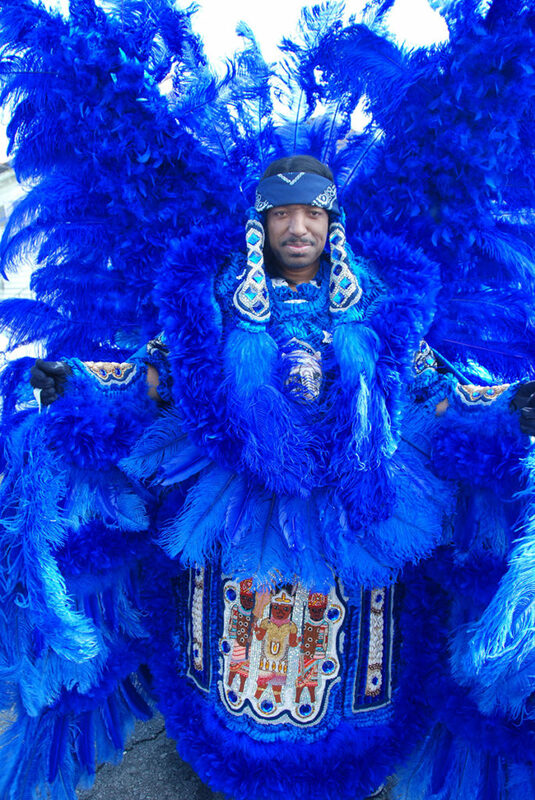 The day seems perfectly geared to the Mardi Gras Indians, especially since one never knows exactly where to find them. We followed the saffron-fletched Indian down St. Claude Avenue through the Faubourg Marigny and into the Bywater—a neighborhood in the Upper 9th Ward. Just across the Industrial Canal is the Lower 9th Ward, where homes were still in ruins months after Hurricane Katrina. The Indian’s car stopped outside a corner market, and he disappeared inside. We quickly parked and followed him to the small deli in back. “When you goin’ out?” the man behind the counter asked the Indian. We shuffled in line to order. If we weren’t going to see anything until later, we might as well eat. I turned to see the detail of the Indian’s suit—ruby gems with amber beads and cowrie shells swirled in a sunrise design, all within the surrounding canary-colored feathers. His dark hair hung in two tight braids. I wondered if it was really that long or if he wore a wig. He swept out of the market. On the floor lay a lonely yellow feather. I bent, grasped it, and tucked it into my pocket. We are Indians of the nation. Through the park, 30 Mardi Gras Indians were scattered. Some seemed to keep to their tribes, but over time, the chanting and dancing swung their circles wider—until they became one big ring. Crimson blended with emerald, lilac with copper, and turquoise with sunflower. Like the patchwork of New Orleans culture, nothing here is monochrome. The fire from the torches reflected off the beads and temporarily blinded me. I turned and saw the golden Indian from earlier. His suit swirled out around him as he performed a fast twirling, foot-stomping dance, punctuated with shouts. The few other members of his tribe stood scowling and nodding. Others ran quickly around him. The drumming got faster. Just watching made me breathless. With a “whooooooop!” the dance ended. He stood with his legs apart and arms crossed, breathing quickly. He looked over the crowd and his eyes locked on mine. The brightness of his wide smile rivaled the torches and he walked over with his arms open. “You’re always welcome with the Indians, little sister,” he said. And the strength of his hug was just what I’d expect from a Mardi Gras Indian. The most interesting stories about American travel, delivered directly to your inbox. Jill K. Robinson writes about travel and adventure for AFAR, National Geographic Traveler, Travel + Leisure, Outside, Robb Report, Private Clubs, Virtuoso Life, Saturday Evening Post, Sierra, San Francisco Chronicle, and more. Her essays have appeared in Travelers’ Tales The Best Travel Writing and The Best Women’s Travel Writing. She has won Lowell Thomas, Society of American Travel Writers, and American Society of Journalists and Authors awards. Or support The Statesider's work in other ways.